I failed to mention in yesterday’s post that the Hungarian scientist who says computers can help dogs communicate, actually has written a program that can translate dog barks into human language, I just wanted to clarify. This work could harm French’s status as the language of love. 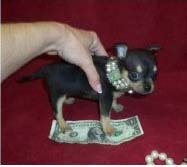 Je t’aime small dogs. 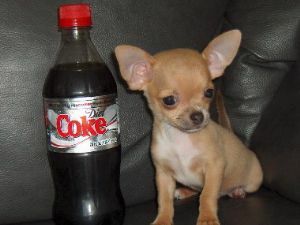 Je t’adore small dogs. Veux-tu m’épouser small dog? A sign stating “Small Dog Recreation” at a dog park in Tuscon, Arizona has the community in an uproar. Community memeber, and large dog owner, George Reiblich said, “Oh no, they can’t do that. Oh, my God, they’re turning it into a small-dog park!” The horror! The tragedy! Reiblich went on to say, “It’s quite a beautiful sign; it really is…We think it probably means it’s a small park, not that it’s for small dogs.” Don’t be a hater George! A man in Texas, with a small dog on his lap, led police on a “mostly low speed pursuit.” The man and his 12-year old dog were both taken into custody. It’s a bird, it’s a plane, it’s vicious hawk trying to attack and kill Janie Flores Chihuahua Tico. Sadly, Tico is in critical condition, unable to move his back legs and may have suffered irreversible neurological damage. Poor Tico. This kind of thing is becoming epidemic. 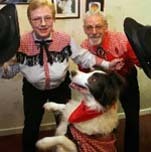 After reading this article about a new canine line-dancing club opening in the UK, I am debating a move. Entry filed under: dog, dogs, January 2008, puppy, small dog, small dogs. Tags: Canine Line-Dancing, French, Hawk Attack Dog, Language of Love, Low Speed Pursuit, Texas. People are strange when you’re a small dog, Faces look ugly when you’re alone, Women seem wicked when you’re unwanted, Streets are uneven when you’re down. I’m sure you’ll understand my point of view, We know each other mentally, You gotta know that you’re bringin’ out, The small dog in me. how is it that no one is leaving comments!?! well i’m glad you’re back. Viva la smalldogarific! Glad to have you back…though I’m sorry to hear about Tico. Hope he perseveres. Canine line dancing may be for us. We’ve had years of classic ballet training and it shouldn’t go to waste. btw what is line dancing? If scientists can turn barks into human voices, can they turn my voice into a bark? And can they do it by this July? Yes. And, does this have anything to do with Christmas in July?? ?